The either/or scenario we painted last week (US economic policy will work and inflation return, or it will not and interest rates will remain low) still stands. We lean to the latter, while investors are swinging between the two. This is again a time when macro-economic analysis and markets seem to live in different worlds. A fortnight ago shortening maturities would have been a good move. 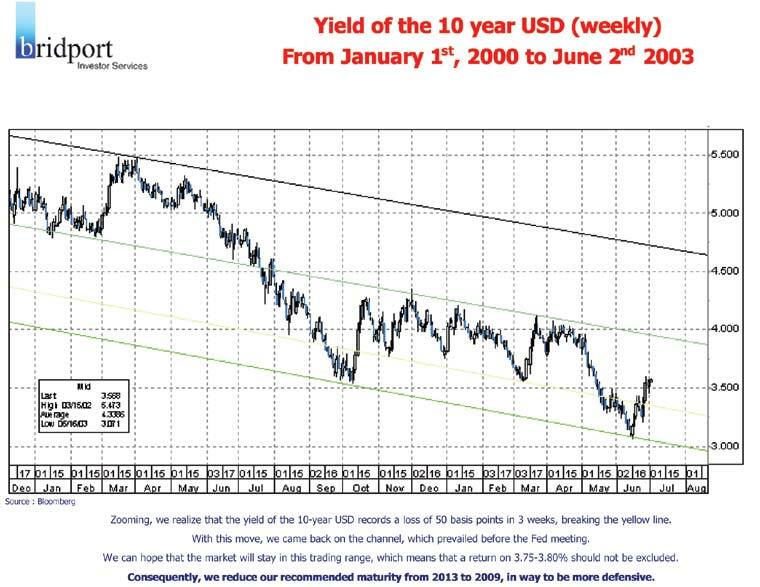 Most of our readers did in fact receive a technical analysis from us which warned of a likely rise in USD ten-year yields. From now on, when we have such an analysis, we shall attach it to our Weekly (as we do this week), so that all readers may benefit from this "second pair of glasses". Somewhat belatedly we are changing our recommended average maturities in dollars and euros to six years, in the expectation (but not certainty) of lengthening again at the end of summer. The move on the euro is "in sympathy" with the dollar. Whatever arguments we have for lower long-term yields in dollars is even stronger in euros because of the USA's "exported deflation". Indeed, the stronger euro is deflationary. Its strength has little to do with the inherent economic strength of Euroland, and much to do with the USA's external deficit and Asian countries deliberately holding their currencies down against the dollar. That includes China, an economy rapidly reaching world scale but with the financial structure of a poor developing country. The renminbi is under revaluation pressure and its artificially low value represents as much a blockage to rebalancing the world economy as the dollar's earlier over-valuation. The day the Chinese authorities give way to the inevitable, notably by making the renminbi convertible, will be the day when, at last, a world recovery may be hailed. China, together with other Asian countries, which will also revalue, represents the major future source of demand for the world's goods. Such a source is badly needed, as the USA cannot continue spending beyond its means. The second future source is the former Soviet Union, but neither the size nor the growth in population are on the scale of China. In fairness, despite the many criticisms justifiably thrown at Germany and France, there is an improved outlook for reforms on labour costs and flexibility. The low-key victory of Raffarin over public-sector unions on pensions and of Schroeder over IG Metall on the working week are hugely important, even though neither leader dare crow about it. Taming the irresponsible use of union power drastically changed the performance of the UK economy, but that painful shift of power back from the labour movement to the government has yet to be completed in France and Germany. Oddly enough, the too-strong euro has at least steeled the resolve of the ruling parties in favour of reform. The Growth and Stability Pact has to go. The fines for bursting the 3% deficit limit would add fuel to the flames. With a weaker Pact, there will be greater issuance of Government bonds across Euroland, which may explain why the spread of the Bund to swaps is so small. In Swiss Francs there is a plentiful supply of new issues, but a lack of bonds at less than one year to maturity. Supply is tight in the UK, except for inflation-linked bonds, where there is huge calendar for July. The new BoE Governor, Mervyn King, is pointing out the obvious, that joining the euro helps trade with Europe but that independent monetary policy is quite useful - very useful when it comes, as now, to navigating a world with so many economic imbalances. The UK consumer and housing boom is coming to an end, probably much to Merv's relief. 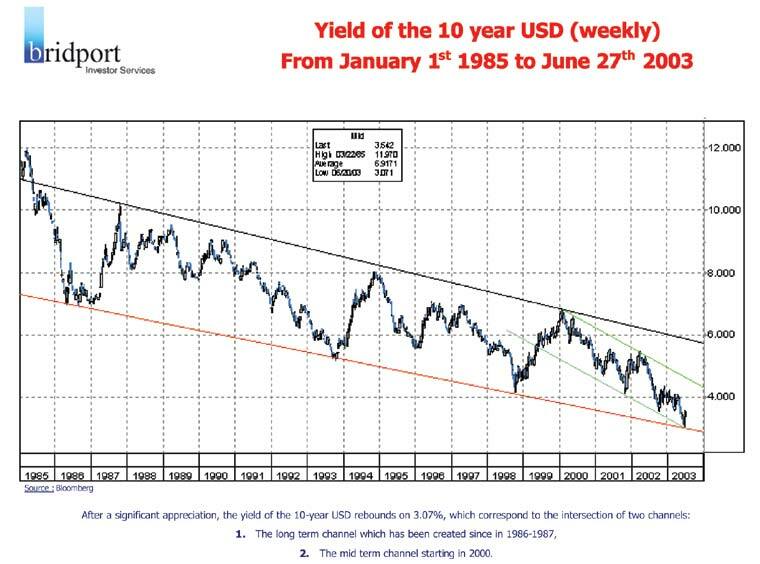 Part of the reason why longer-yields are not behaving according to the proclaimed wish of the US Treasury (and the basic macro-economic scenario) is the massive offering of GMAC to solve (or put off?) pension-fund problems, rumoured to be followed by Ford. There is a certain parallel here with the Federal Government reducing taxes to stimulate spending, while the States have to tax more to cover their deficits. Just as, at the world level, economic policy has to take account of overall balances, within the USA not even the Federal Administration can act in isolation. We recommend modest shortening in USD and EUR, as a defensive measure. Fed easing of 0.25% gave some strength to the dollar, but this recovery has not launched any new long term trend. Rather, it is part of a classical consolidation, which can even drive the dollar to a level of CHF 1.37. On the yen, major buying interest (stops, options triggers) seems present in the 120.30 area, and this can have a short-term impact on the direction of that currency. The Central Bank of Australia has just decided to leave its rate unchanged, which has created some disappointment on the part of the MCA (Minerals Council of Australia), as it claims that the strength of the Australian dollar is eroding industry confidence. EUR/USD The euro has declined but found some good support at the 1.1380/1.1400 area, which gave it enough strength to flirt again with the 1.1600 level. The current view is that 1.1650/1.1700 should be the top of this small up-trend, after which the euro may head down to our first target 1.1280. Resistance is at 1.1620, 1.1720 and 1.1950, and support at 1.1480, 1.1380 and 1.1220. USD/CHF Technically speaking, the CHF is giving headaches to analysts, because of erratic moves, but the scenario remains quite the same. This is now in a corrective wave, which can drive the exchange rate to the 1.3700/50 area without breaking the major CHF strengthening trend that started in late 2000. In the short term, another dollar slip to 1.3300/50 may be seen before a return to 1.3620/40. Resistance is at 1.3525, 1.3610 and 1.3780. Support is at 1.3290, 1.3180 and 1.3080. USD/JPY The USD/JPY is still being bid up, now finding good support at 118.70 while seemingly protected above 120.30. This trading range should hold, and we are looking for a strong break to show us the way. In the longer-term view, there is consolidation between 117.50/122.00, but the major trend still remains negative. EUR/JPY The 134.20/70 area has been well held and some euro strength should be seen up to 139.40/70, where a new downside wave may take place to drive the euro back to test 134.20. Resistance is at 140.20 and 141.10. Support is at 135.50 and 134.20. GBP/USD This correction trend should remain until the 1.6250/6300 area. Resistance is at 1.6720 and 1.6810, and support at 1.6450 and 1.6220. USD/CAD same as last week; only a clear break of 1.3300 on a weekly basis would speak for further CAD strength. In the meantime, the small up trend may continue to 1.3700/50. Resistance is at 1.3680 and 1.3780. Support is at 1.3420 and 1.3360. AUD/USD The support is now at 0.6600. It looks like the end of the up trend is near.